I was introduced to Kyäni one month ago today. I had injured my back 25 years ago in three areas and had moderate to severe pain every hour of every day with no relief. I could not take any medication. I had found what little relief that I could through herbs, vitamins, and minerals but it was not significant. 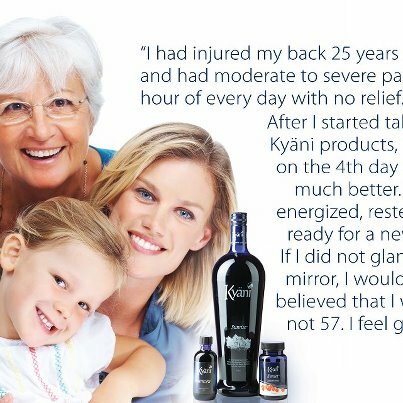 After I started taking the Kyäni products, I awoke on the 4th day feeling much better. I felt energized, rested, and ready for a new day. If I did not glance in a mirror, I would have believed that I was 27, not 57. I feel great! My grandson, Justin, started using the Kyäni 7 day trial pack that I sent for him. He called me on the phone. I could hear that he was different right away! His mom says he does not get tired at school, is more focused, and performs better in physical activity without soreness. I just sent another 7 day trial pack to a granddaughter that has a learning disability and can hardly wait to see the results! A friend with joint pain is feeling so much better. I could go on. 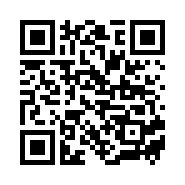 This product line does give the body what it needs to repair and heal itself in the healthiest way possible. What a wonderful place the world could be if everyone felt as healthy, pain-free, energetic and focused as I do! Thank you Kyäni!